Secretary of the Navy Richard Spencer joined sailors and Marines aboard the San Diego-based amphibious assault ship USS America to celebrate Thanksgiving in the Arabian Gulf. Spencer and his wife served turkey onto each passing plate, then sat down with the crew and shared the special meal. “As a mom, I wish I could hug you all and say happy Thanksgiving,” said Polly Spencer as she thanked the service members for their sacrifices being away from family. 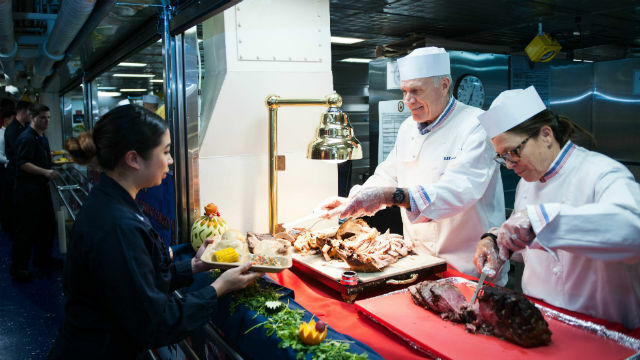 The meal for the America’s crew of 1,000 and 1,700 embarked Marines was served with all the usual Thanksgiving trimmings on a vast scale. The entree consisted of 540 pounds of turkey, 520 pounds of baked spiral ham and 500 pounds of prime rib, while accompanied with a variety of side dishes and eggnog to drink. While aboard the ship, Spencer conducted an all-hands call in which he reminded everyone of the Navy’s commitment to maritime dominance and power projection in an uncertain age. During his service in the Marine Corps, Spencer served as an H-46 pilot with Marine Medium Helicopter Squadron 161, the Marine Corps’ first tactical helicopter squadron. That squadron is currently embarked aboard the America. The America leads an amphibious ready group with the embarked Camp Pendleton-based 15th Marine Expeditionary Unit on deployment in the U.S. 5th Fleet area of operations.